Dr. Teuscher develops disruptive new computing paradigms and machines that will allow for lasting breakthroughs and open new application domains in the next 5-20 years. This quest is motivated by the fact that as feature-size scaling and “Moore’s Law” in CMOS circuits further slow down, attention is shifting to computing by non-von Neumann, non-CMOS, and non-Boolean computing models. 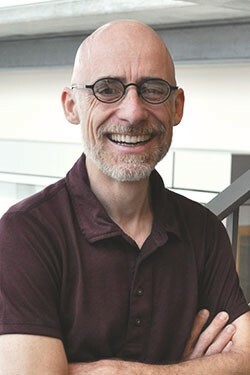 Teuscher’s research group uses radical interdisciplinary approach and applies tools from computer science, computer engineering, physics, biology, complex systems science, and cognitive science to the study and the design of next generation computing models and architectures. Teuscher has also published multiple books and over 100 scientific publications. SJ Dat Tran and C. Teuscher, Memcapacitive Devices in Logic and Crossbar Applications, International Journal of Unconventional Computing, 13(1), 2017. J. Burger, A. Goudarzi, D. Stefanovic, and C. Teuscher, Hierarchical Composition of Memristive Networks for Real-Time Computing, Proceedings of the 2015 IEEE/ACM International Symposium on Nanoscale Architectures (NANOARCH), 33-38, 2015. J. Burger, A. Goudarzi, D. Stefanovic, and C. Teuscher, Computational Capacity and Energy Consumption of Complex Resistive Switch Networks, AIMS Materials Science, 2(4):530-545, 2015. C. Teuscher. Unconventional Computing Catechism. Frontiers in Robotics and AI, 1(10), 2014. X. Guo, F. Merrikh-Bayat, L. Gao, F. Alibart, B. Hoskins, L. Theogarajan, C. Teuscher, B. Linares-Barranco, and D. Strukov, Modeling and Experimental Demonstration of a Hopfield Network Analog-to-Digital Converter with Hybrid CMOS/Memristor Circuits, Frontiers in Neuroscience, 9(488), 2015. A. Goudarzi, C. Teuscher, N. Gulbahce, T. Rohlf, Emergent Criticality Through Adaptive Information Processing in Boolean Networks, Physical Review Letters, 108(12):128702, 2012. A. Sinha, M. S. Kulkarni, and C. Teuscher. Evolving nanoscale associative memories with memristors. In Proceedings of the 11th International Conference on Nanotechnology, pages 860-864, Cincinnati, OH, USA, 2011. T. Rohlf, N. Gulbahce, and C. Teuscher. Damage Spreading and Criticality in Finite Random Dynamical Networks. Physical Review Letters, 99, 248701, 2007.